It was a good old-fashioned work party Saturday on one of the oldest and loveliest sections of the RT: the old Melbourne Loop, now a rustic footpath between the John Warner / Meadowcreek Parkway bike trail and Meadow Creek. 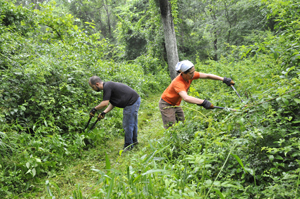 Despite unexpected rain showers, a dozen volunteers armed with loppers, mowers, and muscles reopened thick thick vegetation in less than two hours. Visit RTF's photo album to see our mighty volunteers. There are beautiful new distance markers along the two-mile paved section of the Trail that runs from Riverview Park along the river. The posts are accurately measured and permanently placed every quarter mile on the left side of the path. The markers--a gift to walkers, bikers, and runners alike--were donated and installed by Mark, Alec, and Adrian Lorenzoni (of Ragged Mountain Running Shop), with some really great help from Nick Wispelwey and Thomas Adam. Thanks from the RTF! Volunteers keep the Rivanna Trail open! 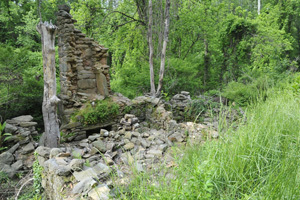 The Poor House and nearby trail on UVa grounds received a sprucing up during Earth Week thanks to Carey Hill’s efforts to coordinate volunteers from the UVa Sustainability Outreach Committee and the Charlottesville Area Mountain Biking Community (CAMBC). Thanks, Carey! highlight the efforts of May’s Second Saturday Work Party volunteers. Under the leadership of Michael Barnes, volunteers mowed, lopped, pulled, sawed, dug, and removed trash from this lovely stretch of trail between the Christian Aid fields and the RT’s intersection with 5th Street near Harris Street. Check out more pictures on our photo pages. June 1, City Parks & Rec. 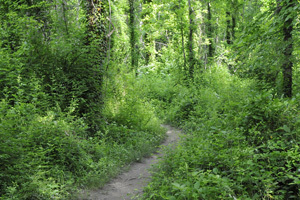 is celebrating National Trails Day by clearing trail in the Ragged Mountain Natural Area. Watch local media for details. June 8, RTF Second Saturday work party. 6’ wide X 7’ high. As the RTF board reported to membership earlier, the southern interchange of the proposed Route 29 Bypass, if built, will impact the Rivanna Trail between Barracks Road and Old Ivy Road, possibly displacing this segment of the trail permanently. The Virginia Department of Transportation (VDOT) is holding a public information meeting to present three design alternatives of the southern interchange. The RTF board has not seen these current design alternatives. We encourage all members and trail users to view them at the public meeting, ask to see them online if unable to attend the meeting, and provide feedback to VDOT as appropriate. View VDOT’s official announcement of this meeting. Congratulations to Andrew Heatwole, who achieved the status of Eagle Scout on April 28. Andrew's service project was to design and build a new bridge for the Rivanna Trail, which was installed last fall on the Observatory Hill section. The Trail has been the beneficiary of a number of Eagle Scout projects over the years, and we congratulate Andrew on his achievement and thank him for his service to the RTF. The March work party installed some new signposts at the Holmes Avenue trailheads, and moved a stretch of the trail between there and Locust Avenue onto higher ground. Part of this stretch has long been subject to flooding, so we shifted a bit of the trail out of standing water to what we hope is drier ground. The muck quotient is still high because of the melting snow, but the hope is that this part of the trail will now drain and dry out quicker. 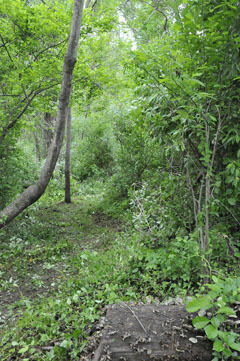 Please help establish the new path the next time you're in the area! Thank you, warm footed volunteers! In architecture, a lintel is a “horizontal structural element” used for various purposes. To the RTF, lintels are a convenient way to get hikers through shallow water. Unfortunately over time they crack and disintegrate. Luckily for us hikers, February work party leader Nick Hamblett and his merry band of volunteers were not deterred by cold water. The bridge connecting Quarry Park to the Rivanna Trail is closed while a replacement is installed. The original bridge was in declining health, and the RTF partnered with the City to purchase and relocate the pedestrian bridge that was used during the Jefferson Park Avenue bridge replacement. Access to this segment of the trail is available from the Route 20 and Avon Street ends. The new bridge should be open later this spring. 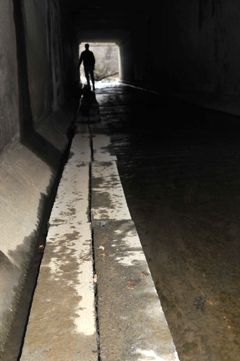 Approximately a dozen enthusiastic volunteers gathered at the RTF shed on January 12th under foggy and cooler than expected temperatures to attack two sections of the Rivanna trail that were experiencing some erosion along Moore's Creek. The first section that we tackled was the section from Azalea Park to 5th Street. After crossing the creek we sidecut into the back re-routes of the trail in about 4-5 sections as well as clearing debris from a downed tree that was blocking the trail. We finished that section around 11:00 and then made our way to Jordan Park to do the same on the section of the trail from Jordan Park to Avon Street. Thanks go out to all who vounteered to making this a very successful work Day. 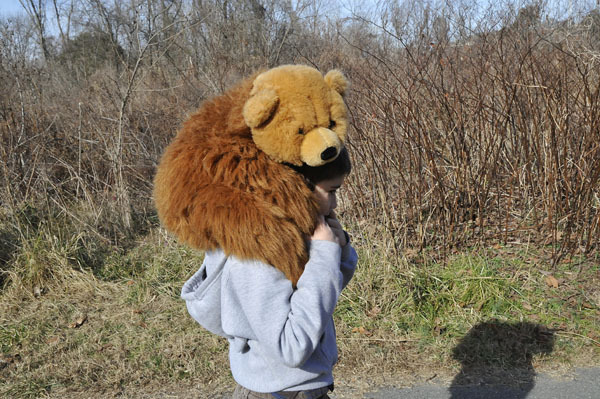 On Jan. 5th several dozen enthusiastic coated, hatted, and gloved kids hit the Rivanna Trail with bunnies, bears, caterpillars, dinosaurs, salamanders, dolls, and monkeys for the 8th annual Teddy Bear Hike. Thank you, Blue Ridge Mountain Sports, for hot chocolate! See more kids and animals in the RTF website photo album.